Leaders, architects and engineers from all over the world and from different eras have always wanted an ‘unique’ construction project in their state or country. Here is a list of the most unique and definitely the craziest construction projects ever proposed. After 30 years of making, Boston’s Big Dig opened in 2003 and is now one of the most complicated and expensive engineering projects in the world. Officially known as the Central Artery/Tunnel project, it was developed as a response to Boston’s traffic problems. The Big Dig that included rearranging centuries-old gas, water, electric, phone and building a new tunnel with as many as four highway lanes in each direction. The project also included a tunnel to Logan Airport as well as a cable-stayed bridge to replace the double-decker truss bridge over the Charles River. It amounted more than $14 billion. Like Boston and many other metropolitan areas, Tokyo too is facing traffic congestion issues. To tackle that, the Sky City project has been proposed. It will be 3300 feet tall making it the tallest building of the world. Owing to its magnanimous capacity, the building will be a mini version of a city in terms of population it can contain. This is expected to reduce a lot of traffic as everything required will be in just building, so the need to travel across the city will reduce. The plan consists of a building 1,000 m (3,281 ft) tall and 400 m (1,312 ft) wide at the base, and a total floor area of 8 km² (3.1 sq mi). Drawn up by construction firm Takenaka for the city of Tokyo in 1989, its design was the first of the modern super-tall mega-structures to gain serious attention and consideration by any government. “The Millennium Challenge” tower also known as the “Al Jaber Tower” is a super-tall skyscraper designed by architect Omero Marchetti as part of his proposed “ethic city” concept. The aims of the project are to reach a nautical mile in height while “not using concrete, orthogonal grids, traditional systems, mortars, [and] cranes.” The building would dispense with right angles and perpendicular planes as those structural engineering norms make large quantities of cast iron and concrete “follow an unnatural and twisted geometry,”. Instead, the project uses the hexagonal matrices of snowflakes, which as structurally supported objects combine high volume with low weight, as the basis of its structural design principles. Another interesting project proposed in Japan is that of the Shimizu Mega City Pyramid. It is estimated to be approximately 14 times higher than the Great Pyramid of Giza, and would house 750,000 people. The pyramid will be able to hold skyscrapers with a height of 100-stories. If built, it will be the largest man-made structure on Earth. The structure would be 2,004 m (6,575 ft) high and would resolve Tokyo’s trouble of increasing lack of space. Buckminister Fuller proposed the mile-high, two-mile-wide glass Dome in 1960’s over the city of Manhattan. It was designed to filter and keep the air of Manhattan free from outside pollution. Also the dome’s temperature would be maintained so the building inside would not need to be heated or cooled. However, the plan was never passed as according to Fuller, 16 large Sikorsky helicopters would have to work nonstop for three months while fitting the glass in to the aluminum frame. The cost for building would have soared space high as two-hundred million dollars was the approximate cost for the helicopters alone. Another odd proposition was by the famous architect Frank Lloyd Wright of the Mile-High Illinois – a building as vertically long as one mile. The idea was to provide a place where people could live and work without driving 20 miles out of town twice a day. Aware of the swaying issues, especially in a town nicknamed “The Windy City,” Wright designed it like a tripod, sturdier at the bottom and tapering at the top. Unfortunately, the design never found its place out of the paper as he died 3 years after drawing its design. Interestingly, it served as an inspiration for the world’s tallest building till now, Burj Khalifa. Dubai has always surprised the world with its construction ideas and projects. But this time, it thought to construct the World itself. “The World” was proposed to be a set of islands off Dubai’s coast in the shape of the continents. Then these islands would be sold off and lived on. They wound up building the islands but unfortunately sometime then the global economy tanked. Only one of the islands is inhabited currently and many others being bought by celebrities. An out of the box eco-friendly construction idea is that of Vertical Farming. It has been estimated that 80 percent of people will live in urban areas by 2050 and given the miserable scenario of our present condition, there could be shortages of food and farmable land. Vertical farming literally creates farmland on floor after floor and with controlled temperatures, you could farm all year round. Joseph Stalin wanted a building satisfying his whims and fancies. What were they? For starters, the tower was 1,300-feet tall, about 500-feet taller than the tallest building at the time. 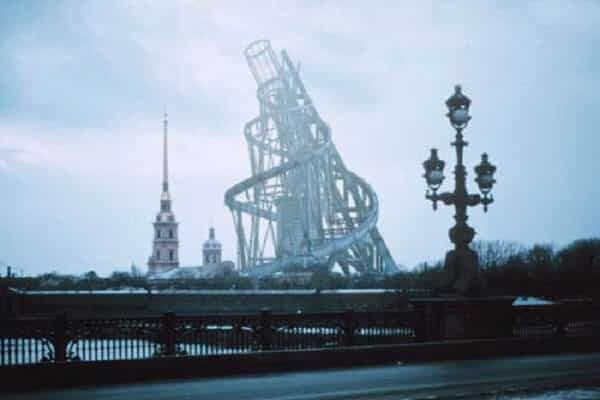 The proposed building was to be a cube, topped by a pyramid, with a cylinder shape leaning over it, surrounded by twisting steel helices and outfitted with a giant projector to project propaganda onto clouds on overcast days.As a cherry on the cake, Tatlin also wanted the building to rotate once in a year! Topping our list of the craziest construction projects ever proposed is by none other than Joseph Stalin. This time he wanted to do something in the memory of Vladmir Lenin. He proposed a building 1392 feet tall and a 260 feet tall statue of Lenin over that. After receiving widespread praise from architects worldwide, the Soviets started construction on the building in 1937, spending two years on the foundation alone. But then the war happened and Stalin’s yet another dream didn’t come true.